There’s nothing better than ringing in a summer weekend with a nice neighborhood block party. Except when it’s 7 a.m., and the guests are ravenously eating your flower beds, trees and manicured lawn. 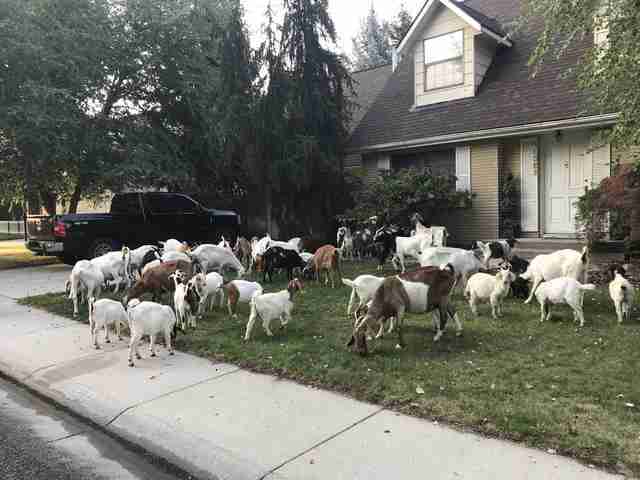 This was the scene for homeowners Friday morning when they awoke to a random herd of nearly 100 goats taking over their Boise, Idaho, neighborhood. Where the animals came from was a complete mystery — but it was clear the hooved gang was having the time of their lives. 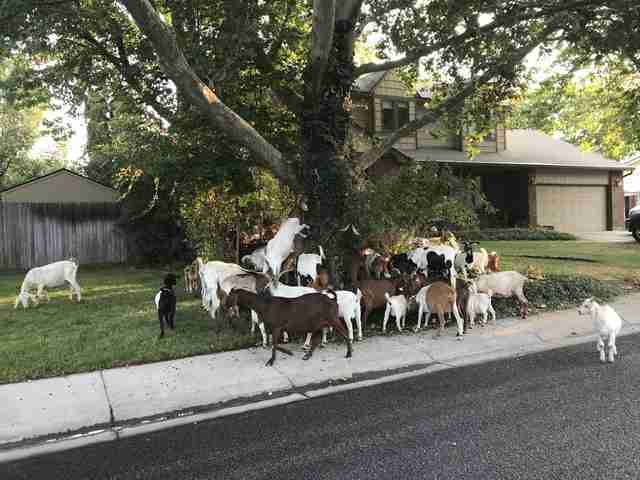 Packs of the rogue goats swarmed quickly from yard to yard, munching on flowers and pulling the leaves from trees. Others wandered through the streets, surveying which delicious grass or shrubbery they’d snack on next. They climbed into bushes, scaled the sides of trees and walked right up to porches as families watched in disbelief. It was their neighborhood now. Joe Parris, a local reporter with KTVB, snapped pictures and videos of the scene and shared them on Twitter. The great goatscapade quickly went viral — and Parris was ready to get to the bottom of it. 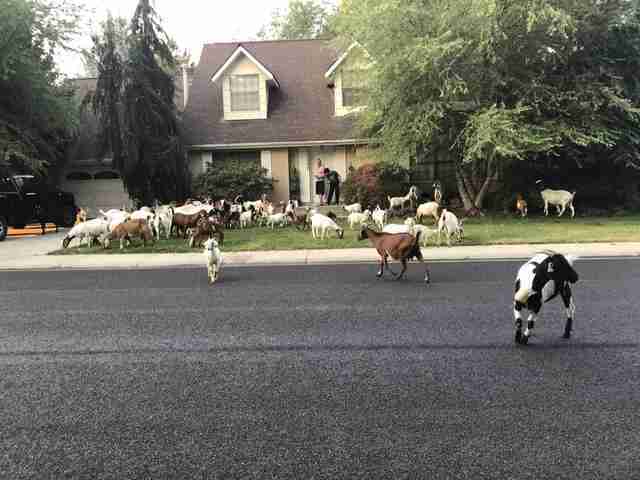 It wasn’t long before local animal control officers showed up, but they soon learned they were going to need a much larger truck to gather this herd. They were simply outnumbered. The fierce munching continued for nearly another hour, until the owner of the goats arrived with a trailer. 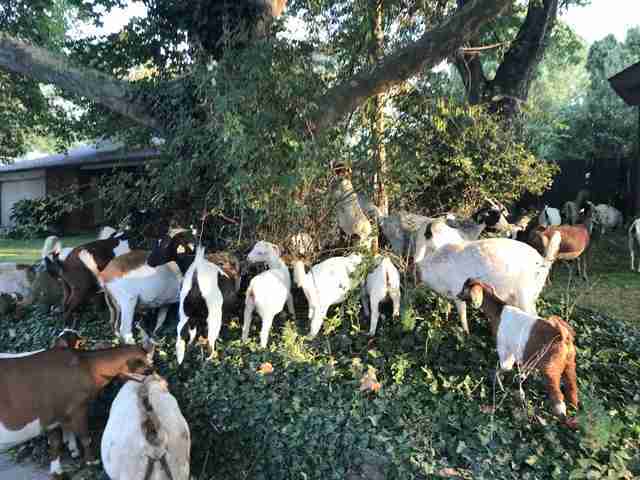 As it turns out, the animals are actually part of a land-clearing company called We Rent Goats, which brings in herds of goats to eat weeds or other overgrown areas. As shown by their clear passion for eating, they seem glad to oblige. The herd had been working on a tasty project nearby the night before, and had apparently hatched a grand plan to make a run for it. Their fun party was over for now, and they headed back to the trailer to move onto their next gig. That’s probably what the goats were thinking, too.